Chroniclers of the diasporic Indian experience are many: celebrated names such as Salman Rushdie, Jhumpa Lahiri, Meena Alexander and Chitra Banerji Divakaruni spring immediately to mind. Despite this crowded field, the fact that Indian Australian writer Roanna Gonsalves’s debut collection of short stories Sunita De Souza Goes to Sydney And Other Stories, manages to stand out is a testament to the author’s mastery of her craft and the felicity of her language. This collection of sixteen meticulously crafted stories explores the displacement, disconnection and alienation experienced by Goans who migrated to Australia. Simultaneously gut-wrenching and thought provoking, these stories probe the fractured lives of those who choose to move beyond the comfort of the familiar and carve out a home in an alien land. Focused mostly on Goan Catholics, the stories trace their compulsive drive to escape their limited circumstances in India and their intersections with mainstream Australian society. Roanna Gonsalves narrates with unsettling honesty the sometimes subtle and frequently disturbing racism directed towards these ‘outsiders’ in their adopted homeland. Perhaps her most powerful stories are those that reveal the interactions among immigrants, between the recent migrants and the established, between parents and children and between lovers in a church gathering. The church and Catholic culture play a major role in the social and emotional lives of these Indian migrants. One of my favourites was ‘The Teller in the Tale’, where a mother and daughter negotiate the debris of past animosities in their lives. The adult daughter, now a creative writing major in Australia, gradually uncovers the uncanny parallels in their lives, both undaunted despite the many obstacles they faced. Their mutual animosity is gradually resolved through the story as the daughter writes a story—the last chapter of her PhD thesis. Like the women in the classic Indian folktale, the final vignette shows the wall of mistrust between the two women come crashing down as they stand beside the Cooks River: ‘a handcrafted silver necklace in the sun’. ‘The Skit’ is set in the living room of an established immigrant couple who invite the ‘Bombay gang’ to meet a white Australian guest, recently divorced from his feminist wife. The room is a shrine to the couple’s pretensions of being a cut above, filled with white furnishings and Ikea lights. An MBA student Lynette, a central character, asks to read her skit—a montage of the newspaper reports of the sexual assaults perpetrated on Indian girls by Australians. Her protagonist’s troubles at the hands of an Australian Student Welfare Officer and her further humiliation by the Australian police are an indictment of the Australian criminal justice system. The assembled guests offer well-intentioned advice, warning her not to jeopardize her chances of gaining the coveted permanent residency. In this story, Gonsalves succeeds in capturing, pitch perfect, the dialects of Indian immigrants in all their nuances and variations. ‘Curry Muncher 2.0’ is a searing look at the recent spate of racist attacks on Indian students in Australia. The victim is Vincent, an Indian graduate student returning by train from his late shift at an Indian restaurant, a job he has taken to augment his stipend and send money to his mother in India. When some drunken louts brutally attack him stealing his wallet and phone, he refuses to report the attack to the police for fear that this would adversely affect his chances of securing the all-important permanent resident status. As the reader flinches at this account, Vincent’s female co-worker, the narrator, wonders how he could be a ‘curry muncher’ as the louts had called him, for curry was a liquid that could only be sipped or poured on rice! And just like that Roanna Gonsalves conjures up the yawning cultural divide that separates the Goan migrants and white Australians. These are technologically savvy migrants who ‘friend’ and ‘trend’ on social media, who stay in touch through Facebook, Twitter, Instagram and email. The young mother in ‘The Permanent Resident’ tries to come to terms with the loss of her child through drowning by learning to overcome her own visceral fear of water; turning the Ian Thorpe Aquatic Centre ‘into an upside-down place of possibility, taking the cruelest month and restoring it someway into self-forgiveness, and towards anotherness.’ The story ends on a note of hope arising out of the earlier turmoil and despair. Roanna Gonsalves’s stories emerge out of the yearnings, anxieties and regrets interwoven through the lives of twenty-first century migrants, negotiating their way through cultural confrontations, questions of faith and the trauma of racism. 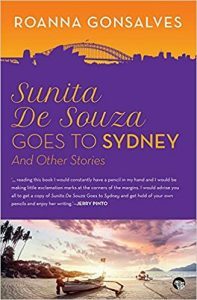 Like Sunita De Souza in the titular story, her characters sometimes avoid slipping down the treacherous slope of infidelity, with Sydney here representing a means of escape from the complications of life in India. The eponymous soccer mom of another story, ‘brownsplains’, explains herself as a brown person in a predominantly white society. In another story an Indian family sits down to an Australian Christmas dinner. The author is always alive to the many contradictions that underpin our lives in this era of globalization and she records such instances with sensitivity, humour, wit and compassion. Occasionally heartrending, frequently lighthearted, they present the truth of what it means to be an ‘outsider’ in modern Australia. This collection of short stories marks the debut of an eloquent Indian Australian voice, who claims her deserved place in the canon of Australian literature. Anita Balakrishnan is Head, Department of English, Queen Mary’s College, Chennai. DA LIT: Dalit Literatures in India edited by Joshi K. Abraham amd Judith Misrahi-Barak breaks new ground in the study of Dalit Literature, including in its corpus a range of genres such as novels, autobiographies, pamphlets, poetry, short stories as well as graphic novels. With contributions from major scholars in the field, it critically examines Dalit literary theory and initiates a dialogue between Dalit writing and western literary theory.